Arsene Wenger has a choice to make when it comes to replacing the injured Alex Song in his starting 11. 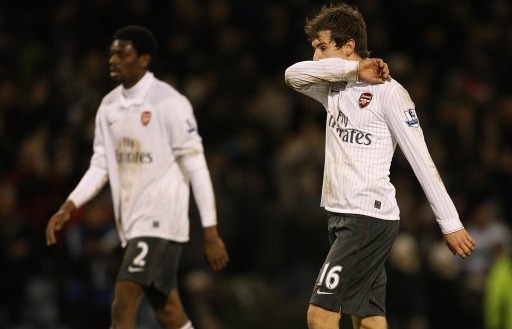 Does he go for Abou Diaby or Aaron Ramsey. My feeling is he'll chose the Welshman. I think that after Denilson's performance against West Brom, the manager has ruled out using the Brazilian in one of the two deep lying midfielder roles.... Arsenal's 4-2-3-1 formation just does not suit him. Abou Diaby has been given plenty of chances before and the Welshman has shown more commitment and desire than the Frenchman in his two outings in an Arsenal shirt this season than the Frenchman has in 16. The other headache is whether to risk Theo Walcott (ankle) and Bacray Sagna (knee) after their late fitness tests. My prediction is the manager won't risk Walcott and start him from the bench but if there is any chance Sagna could start he will. Wenger hasn't fancied playing Emmanuel Eboue all season at right back. I'll post the official team line-up once it's announced. Come on you Gunners!